LCBS CONNECT CONTROLLER & WALL MODULE. The LCBS Connect controller and wall module combination have been designed to control Constant Volume Air Handling Unit, Heat Pump applications. With the embedded control logic and integral temperature, humidity sensors, they control the space temperature in a given zone by regulating the heating and cooling equipment to deliver conditioned air to that space. 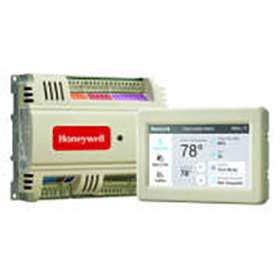 The Honeywell LCBS Connect Gateway serves as the communication device between a building site and the Honeywell Cloud, providing contractors with a way to remotely monitor, control, and configure Honeywell building controllers from Honeywell’s LCBS website. Differential Air Press Sensor, 0-1/2.5/5/10", 24VAC/DC pwr, Panel mount. Use for dirty filter detect, duct/room pressure. Economizer compact-style Direct Coupled Actuator, 27 lb-in, SR, modulating 2-10vdc control, 24vac pwr. Split Core Current Switch, NO, Adjustable trip 1.5A-220A. Use for fan, pump, compr, elect heat, broken belt, etc. Solid Core Current Switch, NO, Fixed trip at .25A. Use as ON/OFF proof for up to 250A fan, pump, compr, or elect heat.